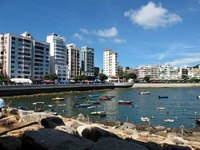 Located just 40 minutes from downtown Hong Kong by bus, the small fishing village of Stanley is a popular day trip for tourists looking to escape the congestion of the city. A bustling village, Stanley is home to a number of attractions and diversions, including several scenic temples and museums. The famous Stanley Market is a winding maze of stalls selling souvenirs like t-shirts, keychains, and knock-off goods, although there's a better selection in Hong Kong City. Bars and restaurants along the waterfront provide good food with great views of the harbour, and the amphitheatre hosts free concerts on the weekends. Stanley is also popular for its beaches. Stanley Main Beach is a pleasant sandy beach only ten minutes' walk from the centre of town. It has good facilities and shark nets, but can get crowded with locals on the weekends. Stanley Main beach is good for windsurfing, and hosts dragon boat races each summer. St Stephens Beach, on the western side of the peninsula, is more secluded but just as popular.